This is a great infographic showing how social media is used and by whom. It helps brands decide what will best represent their brand so they can focus their efforts to what works. Visual products would do better in an image based application like Pinterest or Instagram. Twitter is great for opinions and to quickly get a blast out to the world. Linked in is good for B2B efforts and reaching that corporate reader. Facebook is a very captive audience but it can reach a very specific audience without overdoing it. 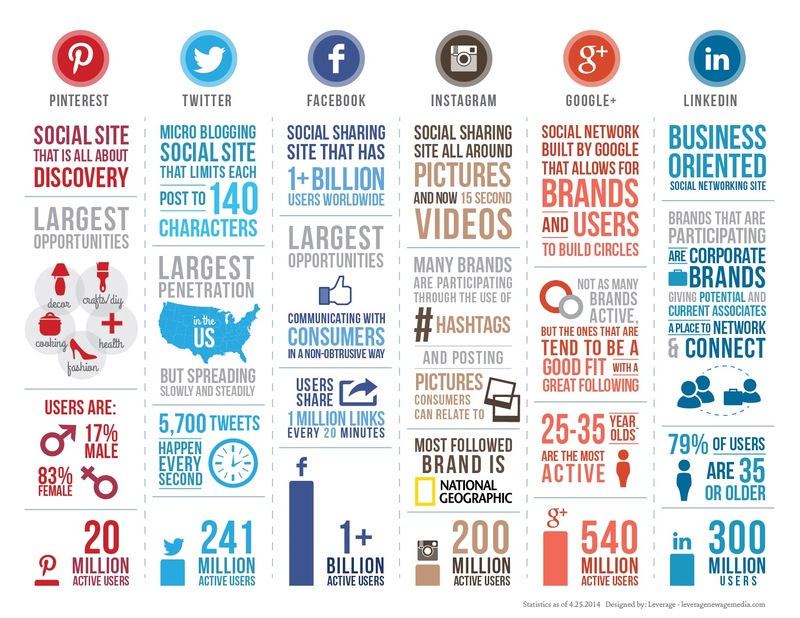 It’s a useful infographic for all of us interested in social media… enjoy! CREATIVE IDEOLOGY, is a advertising, marketing and web design company in Spencerport, NY. We specialize in graphic design and strategic consultation for your marketing needs in order for you to reach your audience. We also work with existing marketing teams to extend their capabilities in design and production. To find out more, please contact Michelle Martorell at 585-319-2839. « Distinct Strategies LLC is now LIVE!